Would You See Any Of These Movies If The Posters Looked Like This? American movies often make their way across the globe. Posters and promotional material must be adapted for the countries where the movies play. Usually, while the language on the posters change, the images tend to stay the same. When the material can’t be imported, some places get creative and do their own marketing. One such place is Ghana, where local artists (with varying levels of training and ability) step in to fill in the promotional gaps. The results are…well, they’re something. Some of them are just poor renditions of the official posters. Some are so out there, we can’t even begin to understand what they were going for. But these were all approved. And despite spanning nearly 40 years of films, the style is oddly consistent. Yeah, what can you do when a pensive worm monster stabs you in the brain? Sheesh. At least the dog, along with its eerily human eyes, seems okay with everything. Well, there’s clearly a lot of limb-chopping in whatever movie from the Chainsaw franchise this is supposed to represent. So much so that even the chainsaw-wielding lunatic doesn’t have legs. Oops. This poster is even more ridiculous than the fact that this made-for-TV movie was even created in the first place. Someone explain that bipedal lizard thing in the bottom left, because that is not on the original poster. I don’t know what movie this is, but it’s not The Road Warrior. None of this happens in The Road Warrior. Does…does the Headless Horseman have breasts? In which Exasperated Dad Hercules tells Hercules, Jr. to please not play with the mini-hydra. Tom? Tom Cruise? Is that you? Tom? What did they do to you, Tom?? In which the boat eats people. Giant people. This was for the lesser-known Nightmare movie, where a concerned Freddy Krueger lets his friend know that there’s a pickaxe in his face. There’s a lot going on here, but I think Imhotep needs a bra. I think this is a poster for the sequel to The Mummy, based on the half-man, half-scorpion the artist seemed to be going for. I couldn’t even begin to tell you what’s going on here, though. The top image of Schwarzenegger is fairly faithful to the official poster, but for some reason, this artist decided to attempt another image on the bottom. The results were not so great. Where is that blue hand coming from? Why is the “o” in “Terminator” a little heart? What happened here? In which the newest model Terminator, this one rather jowly, attends a funeral. I know Grace Jones is androgynous, but come on. There is so much wrong with this I don’t even know where to begin. That anatomy? The fact that this is not a character in the movie? If only someone had made another version. Oh, okay, that’s so much better. That’s not Hellboy. I have no idea who this lounging robot is, but it’s no one in the movie. That is not how you hold a knife. Also, it seems the artist decided to merge the alien and human characters into these purple, oblong-headed terrors. Jeez, Leonidas. You might want to get that lazy eye checked out before you head into battle. This seems like it should be the Army of Darkness poster, but I don’t think it really matters at this point. In this version of the classic vampire tale, Dracula deflates his victims. It seems that when at a loss, the people who made these posters just filled in the empty spaces with explosions and planets. Explosions and planets sell, right? 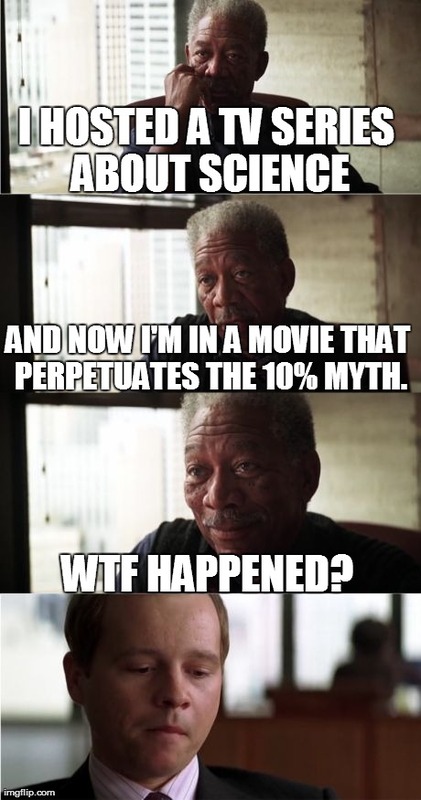 In this reality, Laurence Fishburne is a ginger. Someone put a springer spaniel’s head on a cow’s body, and Mom’s head appears to have a stem. I mean, there’s not much you can do to make this movie any worse. But that tongue is really grossing me out. This is why you proofread. Make your own jokes about blood spots and white pants. I’m done. 30.) Your guess is as good as mine. You mean you’ve never seen the classic The Fierce Ghost Eats Human Region? There’s a part of me that wants to see the movies these posters are advertising. I mean, who wouldn’t want to see James Bond team up with a giant fish? This entry was posted in ENTERTAINMENT and tagged bootleg movie posters, fail, movieposters, movies, Posters, weird on July 2, 2018 by Tom Beaty. This entry was posted in Uncategorized and tagged "gifs", django unchained, movies, reactions on March 7, 2018 by Tom Beaty. This entry was posted in Uncategorized and tagged beetlejuice, hocus pocus, hot, jack skellington, movies on August 16, 2017 by Tom Beaty. 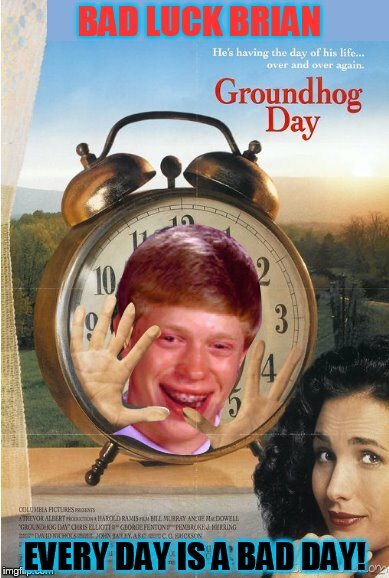 Bad Luck Brian Does a Movie Remake! This entry was posted in Uncategorized and tagged bad luck brian, bill murray, groundhog day, memes, movies, remake on August 8, 2017 by Tom Beaty. If Jurassic Park Taught Me One Thing, It’s That Awesome Stuff Is In Amber. I was convinced of two things after I saw Jurassic Park as a kid: 1) Dinosaurs were real and 2) we could make them with mosquitoes stuck in amber. All we needed was to find them, and BOOM…baby dinos. Well, 20 years have passed, and I now know it’s not quite possible. But I’ll be darned if I’m not obsessed with seeing little things in amber, sitting at the bottom of the Earth for millions of years. Seriously, these things are out of this world! 4.) An Ant With A Parasite Mid Egg Laying In Its Head. 10.) Early Insect Camouflage…Made From Plants. This entry was posted in SCIENCE and tagged dinosaurs, jurassic, jurassic park, movies, spielberg, steven spielberg on November 11, 2016 by Tom Beaty. This entry was posted in Uncategorized and tagged classic-movies, copycat, disney, film-trivia, filmmakers, jessica-catcher, movie-facts, movie-trivia, movies, star trek, Star Wars, trivia on October 31, 2016 by Tom Beaty. 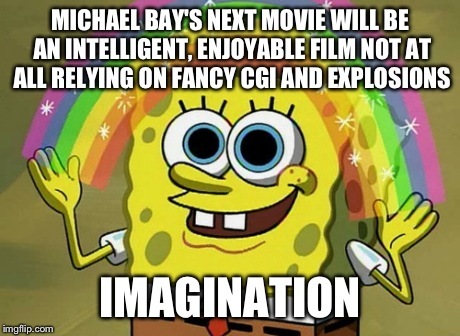 This entry was posted in Uncategorized and tagged "explosion", "imagination spongebob", "spongebob", funny, memes, movies on June 23, 2016 by Tom Beaty. This entry was posted in Arts & Entertainment and tagged Media, movies on May 5, 2016 by Tom Beaty. This entry was posted in Uncategorized and tagged "gifs", donkey, funny, movies, shrek on December 10, 2015 by Tom Beaty. This entry was posted in Uncategorized and tagged books, harry potter, hunger games, movies, pbs, TV on May 12, 2015 by Tom Beaty.